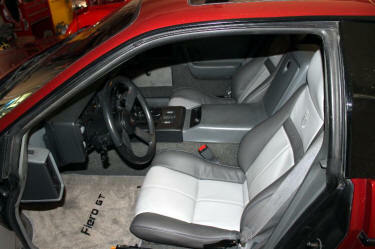 GT strap across the insert replicates the original Fiero GT upholstery. *This strap can be the color of the bolsters (default) or a custom color. Add Color Welts - Free. Embroidered Logos - $29 pr. Speaker holes - $29 pr. Seat Belt Slots - $40 pr. Includes video instructions & install kit. 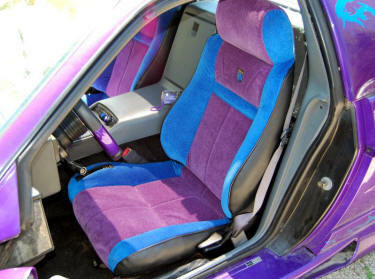 If I knew auto upholstery was this easy I would have done the seats in my 65 mustang myself, instead of paying someone to do it !! 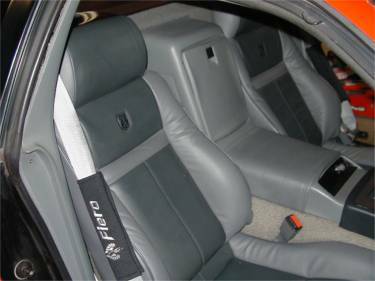 I used Fiero front seats for my 1969 Firebird and you made my back seat to match the new fronts. You embroidered the 1st generation bird front and back. 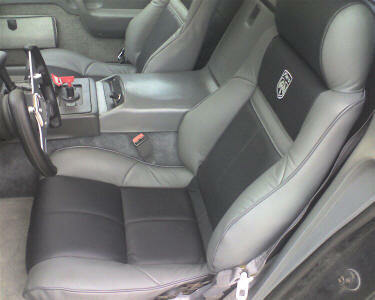 Here is the finished the interior with new door panels so I could send you pictures of your great work. 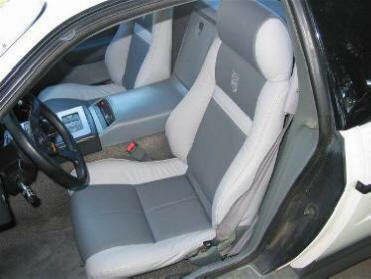 A popular free option is to add 'color edge welt' that replicates the second color of a 2-tone seat. It’s like driving a new car! Very Happy with the kit. Here are the pictures you asked for. Thanks for the great product and quick service. 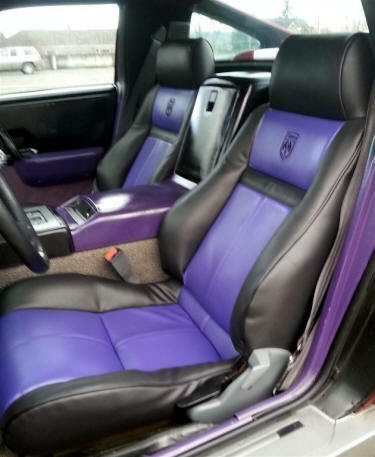 "I am very happy with how the seats turned out. I spent 10.5 hours on the project because I went slow so I would not mess up. You are a craftsman. The tape was very helpful. They exceeded my expectations. I am very proud of them and will highly recommend your product." 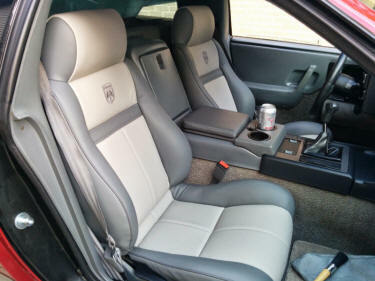 "I just finished installing my new seats and boy do I love them. Your service, instructions, attention to details and superb quality can not be overlooked. This is top notch, no scrimping here.. Thanks a lot." 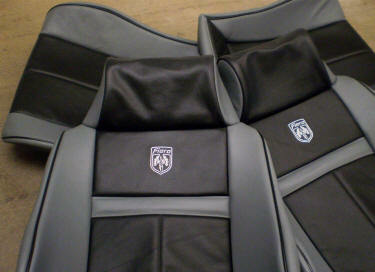 "Finally here are some pictures of the new seat covers! I watched a movie while doing the seats (switching back to MrMikes excellent video instructions now and then) probably made the whole thing take longer :) It took 4 hours to finish the seats. It was indeed easy and gives one a sense of actually being part of the work." 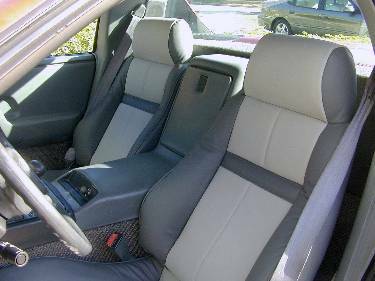 "The material and fit were perfect; when I had both seats covered and sitting next to each other I was amazed to see that they were identical. To create those covers from so many parts and pieces and have them come out exact speaks very highly of your skill and dedication to your craft." "You have put together a great program. I can’t believe how easy the install was and how great it looks." 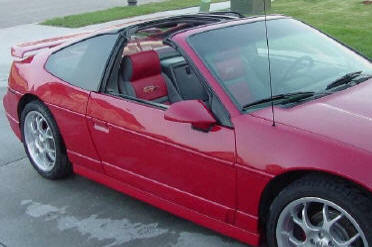 "This my car that I restored from ground up, all panels were painted off the car. Supercharged grand prix GTP engine with 5 speed manual, lowering springs, poly bushings, wheel bearings, ball joints, Koni shocks, brakes." Thanks for all your help. Everyone loves your seats! Are these seats nice or what?! Your video of instructions is so good, thorough, and easy to follow that I only had to watch it once and the two seats went very easily. 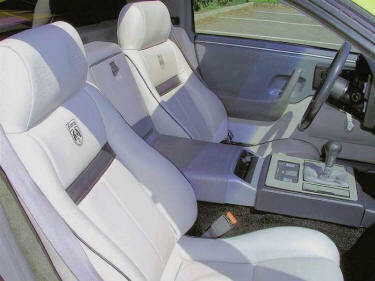 The seats look great and are so much more comfortable. I know they will last just about forever! Thanks!" 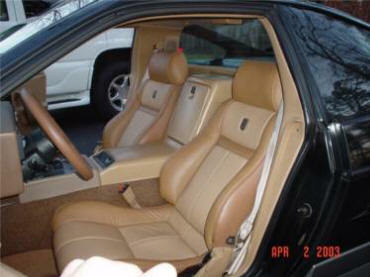 About a year ago I purchased a set of leather seats from you for my '85 Fiero SE. All the 35mm photos I ever took turned out like crap, but my new digital camera works like a charm. Here's the photo I promised you. Thanks again, they look great!" 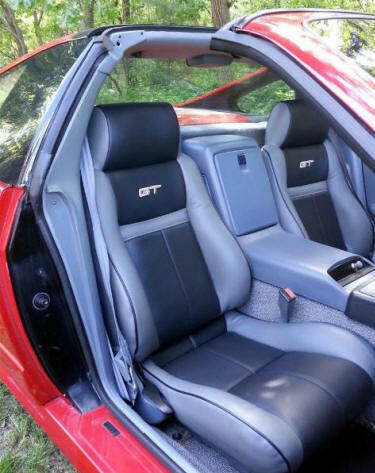 "Hi Mike, here is a pic of my new seats and saddle on my 85 GT, the complete kit contained everything I needed and your DVD instructions were top notch and very easy to follow. The whole job took me about 3 1/2 hours to complete and the results are beyond words!!! 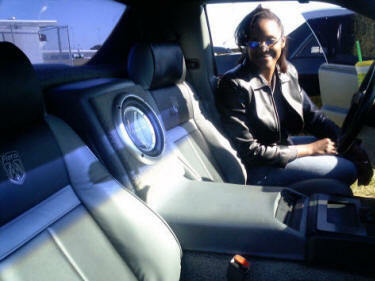 Thanks a million for making my car look like a million bucks!" I want to thank you for the seats. 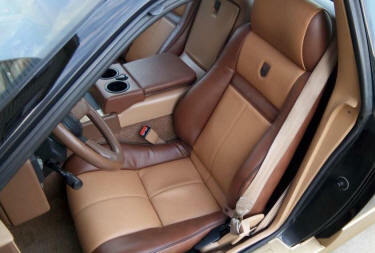 of my Dad's seat covers. I used a 180° wide angle GoPro to take the shots. He's super happy and pleased with the quality." "Hey Mr. Mike! Just wanted to say thank you. 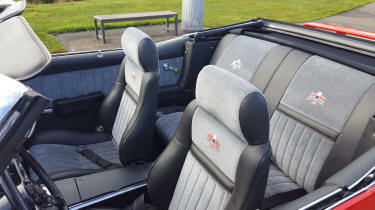 The seat coverings look beautiful, the instructions were excellent and the materials provided were everything I needed which I did not already have. Thanks, in particular for the extra hog rings. I messed up about 50 of them when I missed wires." 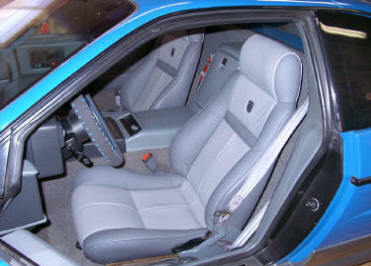 Attached are pictures of our 1988 CJB T-Top Fiero after we finished installing your seats. We made it in time for the Dells Run car show thanks to your expediting; seats were ordered, shipped, and received within just over a week! We really appreciate the quality and customer service and we wanted to say 'THANK YOU'! 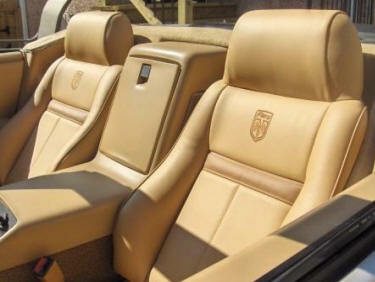 These are the second seats we ordered from you and are very happy with both sets. "I wanted to thank you for the amazing seats. 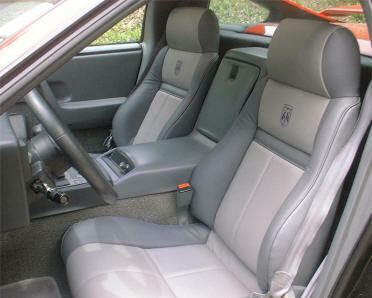 I've put a lot of work into cleaning up my car, but nothing made as much of a difference as the new seats. They're the first thing people comment on. 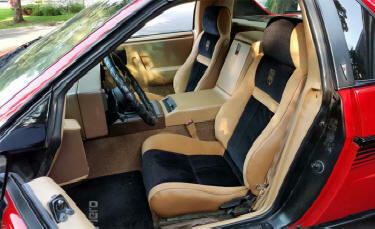 replacement Fiero seat covers, OUTSTANDING! The fit, instructions, and finished product exceeded my expectations. You are producing the best replacement covers out there and I am sure that if I ever need more, I know where I’ll be buying." 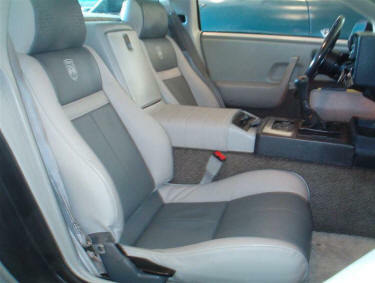 Here are some pics of the job I did with your seat covers. 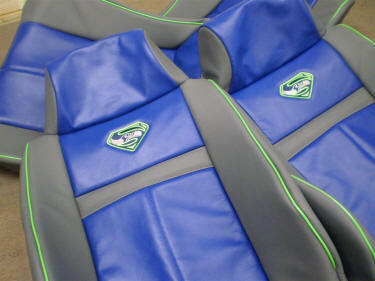 I'm really impressed with the way the seats turned out. Your video instruction is great. It took me 11 hours to do the two seats. 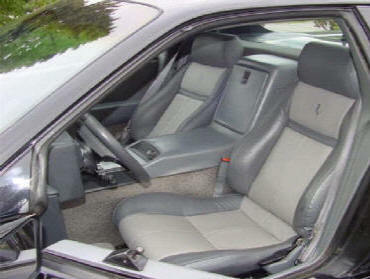 Note the black floor mats. 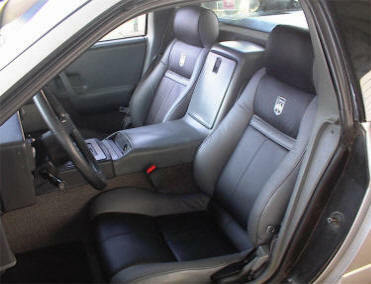 We talked about the black color in the center of the seats flowing to the floor mats. Thanks again for your advise and your awesome product!" "Here you go Mr. Mike!